Prepare for winter with a heating start-up special! 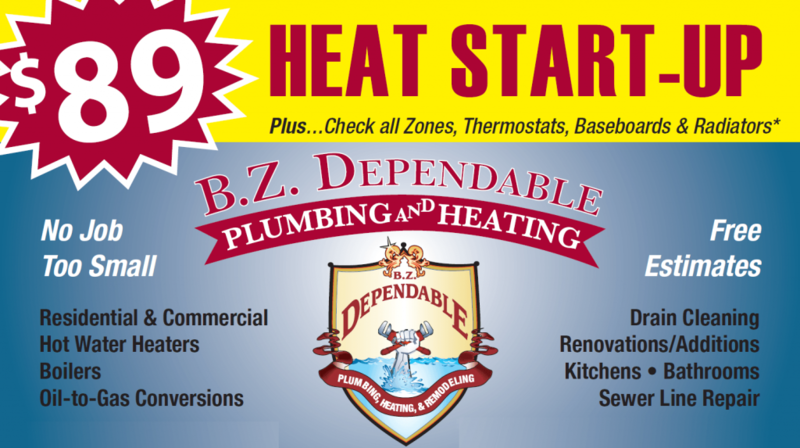 BZ Dependable offer drain cleaning, plumbing renovations and additions, sewer line repair, hot water heaters, boilers and oil-to-gas conversions. Drain cleaning is important for any home that has clogged or frequently backed up drains. To ensure yours run properly at all times, it is recommended that you have a Teaneck plumber visit your home on a routine basis and perform drain cleaning. Here are some of the common cleaning methods we use for drains and the benefits they offer to people in your area. The simplest form of drain cleaning and one that can be performed by most homeowners themselves is plunging. A plunger works well for shallow clogs that are no deeper than the trap in the drain. They are effective in toilets especially and sometimes in bath tubs. However, any clogs that occur deeper than the main drain in the fixture will likely not respond to a plunger. That’s where a snake or cable comes in. A snake or cable allows you to access and remove clogs much deeper in your pipes. These clogs are the kind that will back up almost completely to the fixture due to a solid piece of matter blocking the pipe or because of grease, hair or other matter becoming stuck to the sides of the pipes. Snakes and cables work for most clogs unless they are very deep in the pipes or in your sewer line. If such a clog occurs, the best option is to use either line detection or video camera inspectionto determine where the clog is located and then go to that water line directly. In some cases, the pipe may need to be disassembled to access the clog. Whatever type of clog you have, there is a system that will make it possible to clear it out. The key is to know where to start and when to call a Teaneck plumber like BZ Dependable Plumbing & Heating Inc.. For those especially stubborn clogs, always call a professional who has the tools and expertise needed to use them to remove your clog.